View onto the Prestige residence from across the village ski slope. View from the village slope onto the residence that accommodates the Prestige apartments. View from the exterior staircase onto the village centre of St Martin de Belleville. All Prestige apartments enjoy stunning mountain views. The Prestige apartments are a collection of stunning, newly renovated apartments located in the heart of St Martin de Belleville. The higher you go, the better the views! The Prestige N4 apartment proves this with breathtaking mountain views that can be enjoyed from a large south facing balcony with outdoor seating. Great for an après-ski drink after a long day on the ski slopes. The N4 apartment has been decorated uniquely with brown leather sofas and fury throws. 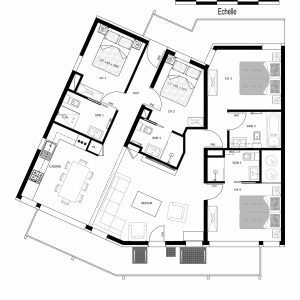 The entire apartment is situated on one floor with a spacious and bright open-plan kitchen, living and dining area at it’s centre. Like the other Prestige apartments it has two double and two twin bedrooms all of which have an en-suite bathroom. NEW this year is free access to Netflix! Watch all your favourite series, movies, and documentaries – Perfect for a snowy evening in the chalet! These ski-in ski-out apartments are located next to the St Martin village-centre drag lift piste. An incredible location with the benefits of not only having all of the village centre amenities right on your door-step, but also the slopes and lift-system. It’s a great location for families and groups of friends alike. Enjoy the flexibility of having all the restaurants, bars, and shops within seconds of your accommodation. The chalet residence that has been built into the slope next to the village piste which gives most apartments direct access to the ski slopes. Whilst on foot you will have to climb some stairs to get to the Prestige apartments’ front door it also means these newly renovated luxury apartment are extremely affordable and would be much more expensive if situated in a free-standing chalet. Prestige N4 is situated 4 flights of stairs down from Rue des Grangeraies, then one flight back up and 7 flights of stairs up from the village centre. To reach the village ski slope from this apartment’s front door you go down one flight of stairs. Next winter season’s prices for the Prestige apartments haven’t been finalised yet. Please contact us for a price quote. A very simple booking process - Directly with us! For all enquiries and bookings for your self-catered chalet holiday in St Martin de Belleville please contact us directly. We are available 24 hours a day, so please don't hesitate to give us a call! If for whatever reason you can't get hold of us then please leave a message or send an email and we will get back to you as soon as possible. You can provisionally book a chalet/apartment for up to 72 hours - For us to do this we require you to fill out our online booking form. Please be aware that we will send a confirmation once your booking form has been received. After 72 hours you can either confirm and secure the booking by paying the 25% holiday deposit or the chalet / apartment will be made available again. "An independent chalet company offering a unique service"
'Self Catered - Saint Martin' is proud to offer an excellent service from the moment you get in touch right up until we wave you off at the end of your holiday. Our Concierge Service starts by helping you organise your ski holiday before you arrive in resort. From airport transfers to ski rental, lessons, passes & catering options. Once you have arrived in resort we are available 24/7, whether it's to assist you with anything or simply answer any questions you may have! We live in resort, welcome all our guests personally into their chalet and make sure every single guest has the ski holiday experience he wished for! A 25% non-refundable deposit is required to secure the booking. The balance is due 10 weeks prior arrival in resort. You can store your luggage in case of an earlier arrival / departure. Please let us know in advance. It's the norm to charge a damage deposit on self-catered bookings. The amount depends on the size and standard of the property. You will find a list below. We will collect the damage deposit ideally prior arrival in resort and release it once we checked the property after your departure. Some of our properties have the option of increasing the capacity and adding extra people on a sofa or fold-out beds. In this case the charge for adding an extra person is 25% of the per person price (Listed price divided by total number of beds in the chalet). The minimum fee is €70 per extra person. You will arrive to a fully cleaned property. In the event that you find it hasn't been cleaned properly on arrival please contact us immediately so we can rectify this as soon as possible. If the chalet is not left according to the chalet check-out requirements, please be aware that an additional cleaning charge may apply and will therefore be taken off the security deposit. There is a strict no smoking policy in all of our chalets. Furthermore pets are not allowed unless permission is specifically requested and given at the time of booking. We believe we have some very special chalets to offer to our guests. From our most luxurious duplex chalet with jacuzzi spa baths, steam shower and boot warmers to comfortable Alpine-style chalet apartments, sleeping between 4 and 12 people. All situated either with unbeatable ski-in ski-out location or within the heart centre of the village! NEW addition for next winter season - Luxurious ski chalet situated in the village centre. Luxury ski apartment with private sauna and ski-in ski-out location! Great value ski apartment situated in the heart of St Martin de Belleville! Spacious and bright chalet apartment, newly renovated to a very high standard! "This two bed apartment was cosy and really well equipped, we were a family of three during half term and it was very comfortable. [...] It is located right in the middle of the village, near the church and less than a minute walk from the drag lift which takes you up a hill to then get access to the main gondola where you can get access to the whole 3 valleys. [...] Dealing with Nadine and Jess at Self Catered-St Martin was a breeze. 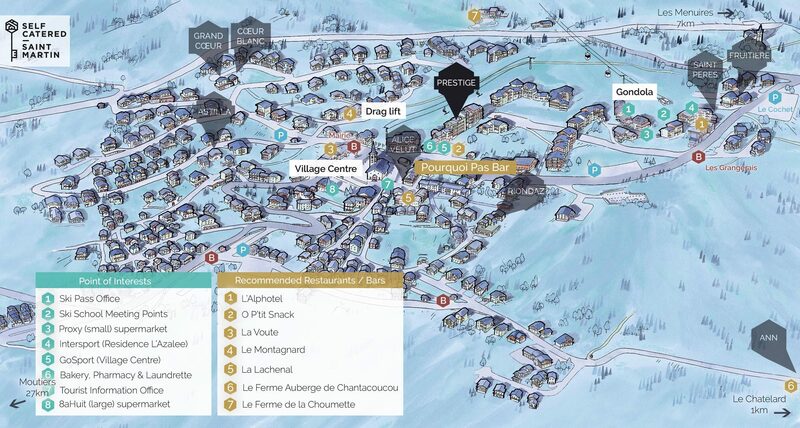 [...]"
LocationFind out more about our ski-in ski-out and central village locations in St Martin de Belleville. ChaletsCompare our chalets and find one that suits you for an unforgettable ski holiday in the French Alps. ResortSee what the ski village of St Martin de Belleville and 3 Valleys ski area have to offer. AvailabilityCheck prices and availability of all our chalets on one page and find your accommodation in St Martin de Belleville. About UsLearn more about us and our independent chalet company “Self Catered – Saint Martin” in the heart of the Three Valleys! © Copyright Self Catered - St Martin 2019. All Rights Reserved.